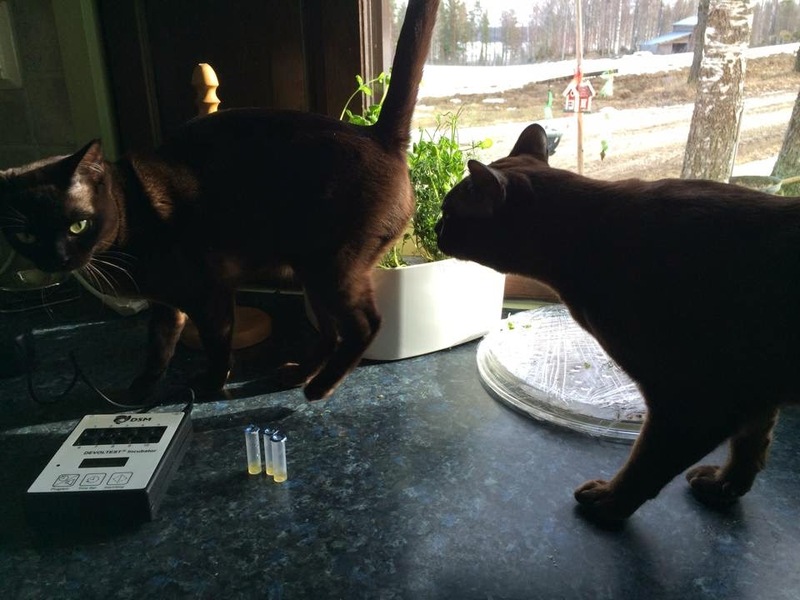 Loyal Readers may recall on Saturday Äiti left us to go to the Pohkis Cat Show in Kokkola.She was the taxi service for what should have been four felines but turned out to just be Burre, Sampo's litter brother. Burre has just become a daddy cat with Jojo from the Arkhitekton dynasty. This makes Sampo a proud uncle, and Jaava and Jura a proud great aunt and uncle. Paws are crossed for the litter - it is early days and Jojo is a great mother. Now Burre is a laid back mancat, he did his job a few months ago so has had time to recover. So, he strolled off to the show and charmed everyone. And he got his 'champion' rosette. He was more interested in playing with a new toy. Now Äiti spotted another relative of perheeni -Seppo's half-sister. They have the same daddy, and this is FI-Tutsi Buccellati who was born in January 2013. She has the most gorgeous blue eyes - Äiti was smitten (oh no!). And she has done very well - she was named the best young cat over in Finland for 2013. Yes, the whole of Finland. She is a gorgeous tortie sphynxie, with a very friendly nature. She gave Äiti a wash - not bad as they had only just met. Äiti knows however, where her heart lies and came back with all these things for us! And in the meantime, a long way from here, Sampo is doing his best to encourage Nippe. Here there is some serious bottom sniffing going on but it seems Nippe is being a girlcat and not cooperating by going on heat! We can assure you Sampo is in excellent hands and is getting loads of love and attention. A date for his return has been agreed, which will be soon if Nippe lets her hormones act. If not, he's back after April. Burre is quite the handsome guy! You are fortunate that Äiti brought home presents and no extra kitties! Burre is very handsome, and Seppo has a lovely sister. I hope Nippe soon co-operates so Sampo can come back home. Mommy is giggling over Burre "recovering" from his Mancatly duties...hee hee! What gorgeous kitties at the show! And Nippe: C'mon girl...you can DO it!!! Huh. That half-sister is a cutie and I don't usually go for the nekkid gals. But I love her patches. And her blue eyes. Perhaps she'd like to give *me* as washie? But here's my question: What if Sampo doesn't even *want* to come home now? What if he's, you know, in LURVE with Nippe? Wait. Gentle nature, large beautiful eyes, no fur and spotted skin - she's not half cow, by any chance? We are missing Sampo so much! We wonder if you kitties will know him when he finally comes back home? What lovelies! Of course, our loyalties lie with you, King P. We hope Aiti was forgiven her transgressions when you saw the great lot of treats she brought home. Enjoy! Whoa! Look at those treaties! Aiti did well by you. ribbon. Seppo's sis a a beauty. Her colouration is magnificent but happen to love our Seppo's looks. Sampo has been away so very long. Couldn't they have waited and called for him when his intended was actually ready? It sure is a small world, we need to arrange something next time! I'm just jealous for all the stuff you got from there, my secretary didn't bring me ANYTHING"